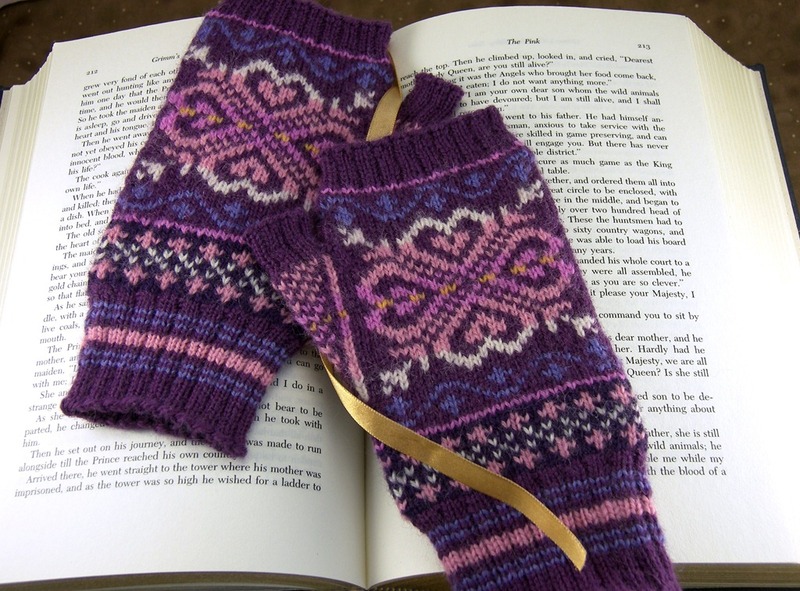 These cute fingerless gloves are inspired by traditional Selbu mittens. 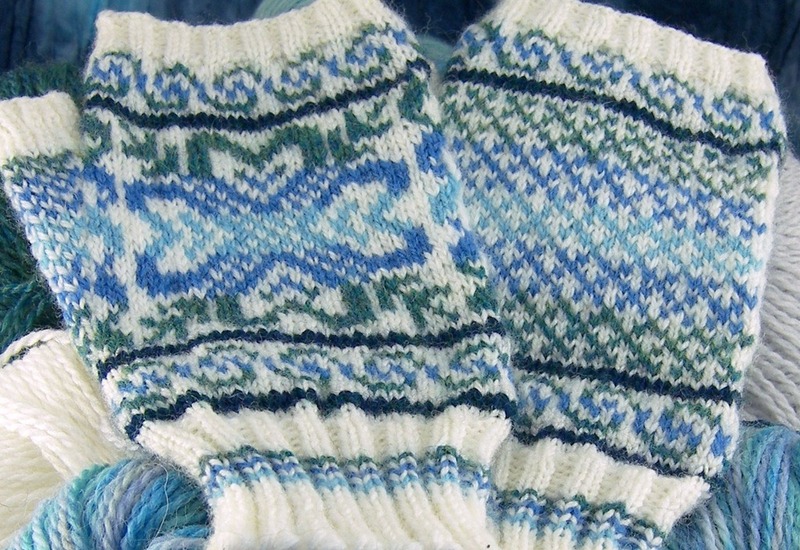 The construction differs from the historical mittens and uses a thumb gusset on the side of the hand instead of a gusset on the palm, but the motifs are all taken from traditional patterns. I can’t decide if the main motif reminds me of hearts, mint leaves, or snowflakes. 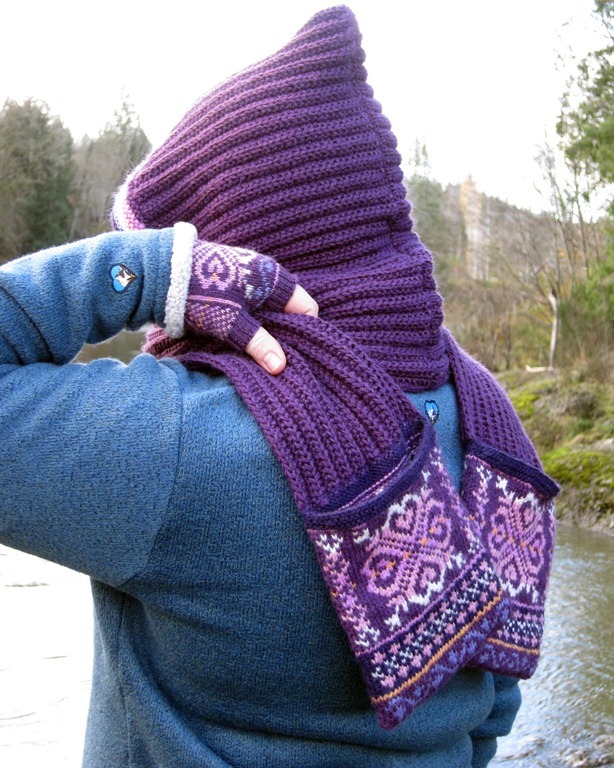 The construction is essentially the same as the Snowflake and the Albuquerque Fingerless Gloves. But these gloves only use five colors (and the background color doesn’t change)! 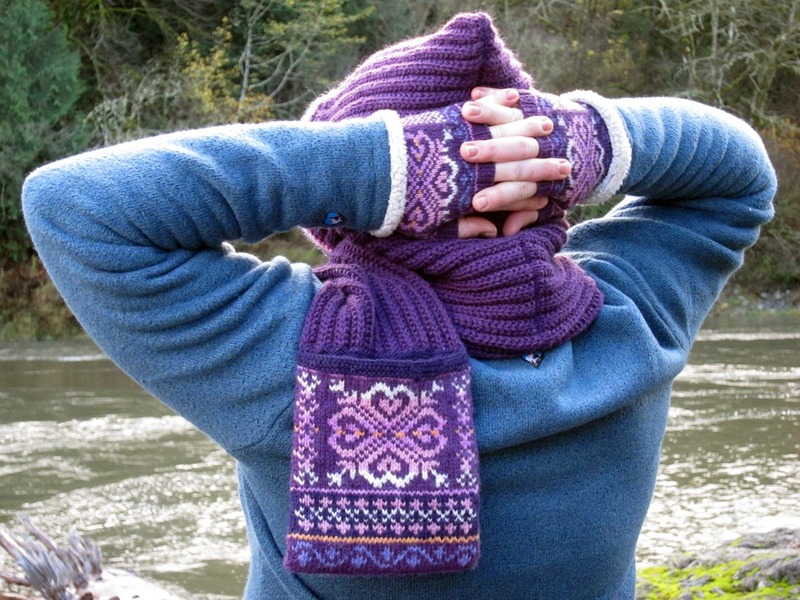 I love knitting these style gloves. They seem to knit up faster than other projects, probably because the pattern changes every row- it’s very addicting! And there’s no fingers to mess with. I’ve found that wearing these over a thin glove liner is just about perfect for Seattle mornings and of course they’re great for typing in cold offices or computer rooms. 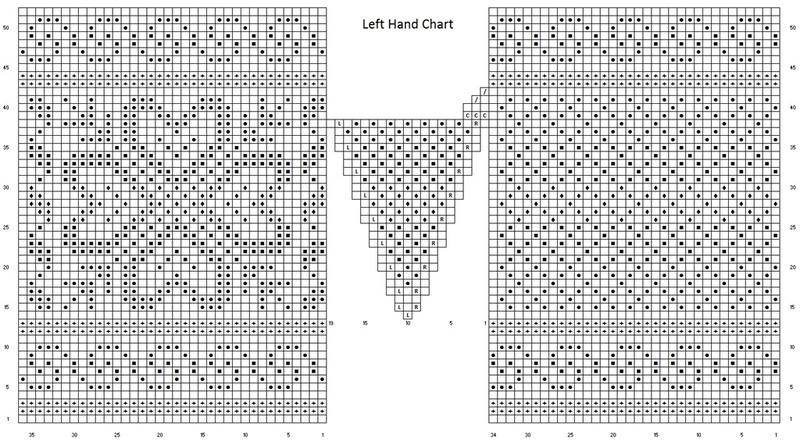 There are separate mirrored charts for the right and left glove for easier knitting (no reading from left to right while knitting right to left!) 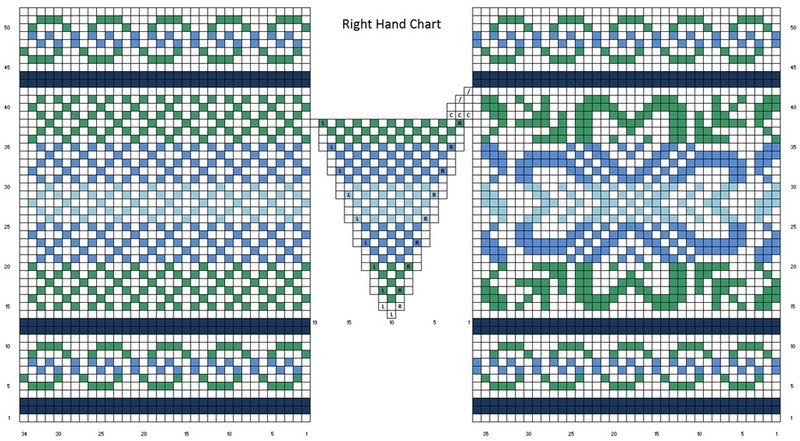 Charts are available in color and symbols below and in the PDF. To make finishing less painful, weave in ends as you go by twisting/wrapping the last yarn for 10-15 sts on the new row. Try joining the new color 10- 15 sts early (the row before it appears on the chart) and carry it along, twisting/wrapping it every other st. This helps eliminate holes at the sides. 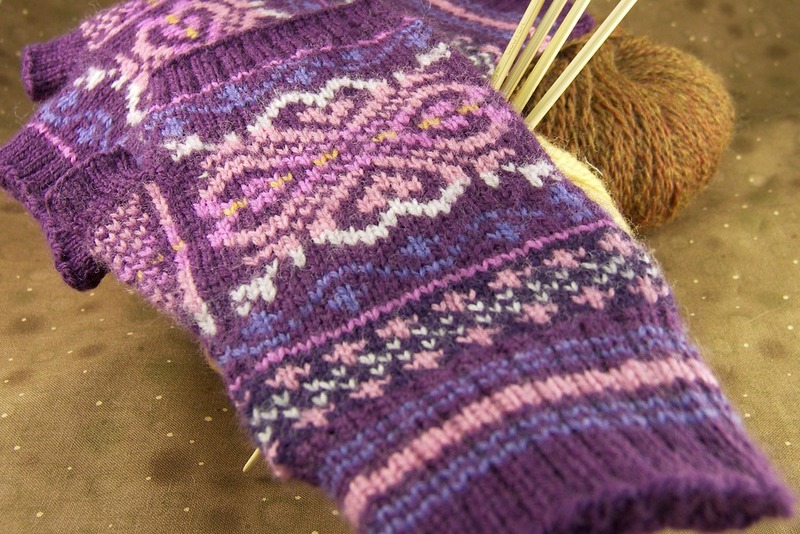 The increases for the thumb gusset are written as yarn overs which are knit twisted on the next round. 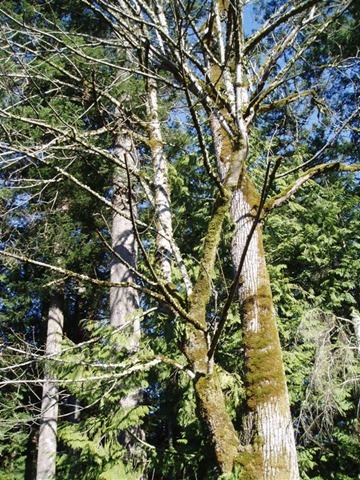 Standard lifted increases can be substituted; the yarn over method can prevent puckering or tension problems from lifting the strands from below. I recommend marking the increases for the thumb with two stitch markers: place the first one before the first YO and the second one after the second YO on the first increase row. Slip the markers every round after this; it will make it easier to know which stitches to put on the scrap yarn when the gusset is finished. 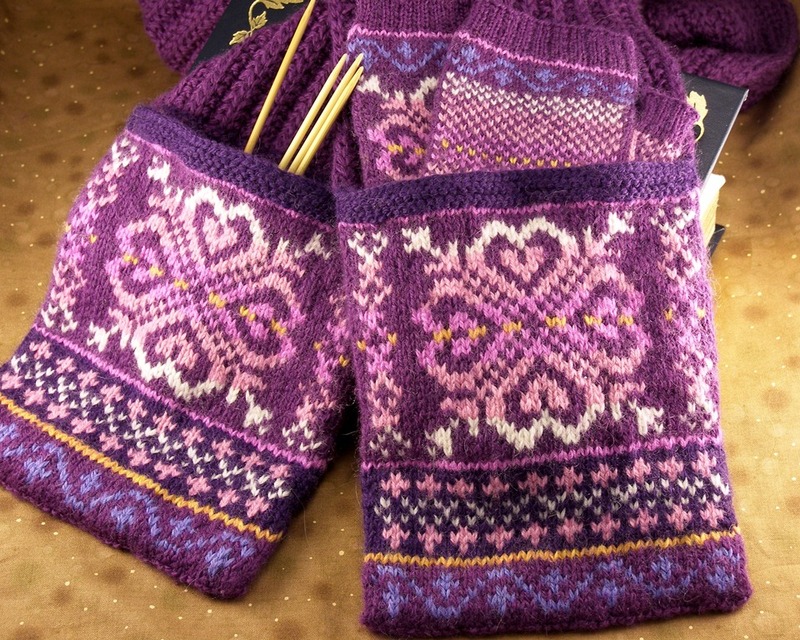 These gloves can be knitted from the charts alone between the ribbing sections, but instructions have been written for rows with increases, decreases, or other things that need attention. If there are no written instructions for a row, follow the chart until the next written row. 11/7/09- Fixed column numbers along the bottom of the charts; numbers now count correctly by 5’s instead of "1, 5, 10, 11, 15." Fixed written instructions to Round 39. 3/21/11- Fixed increase errors in thumb gussets; the first two rounds of the gusset have changed. The first round has only 1 increase, the second has two instead of the first increases being on the palm/back of hand. YO R: Bring yarn to the front by going over the top of the right needle and return to the back under the needle. On the next round, knit into the front of the yarn over. YO L: Bring yarn to the front by going under the right needle and return to the back over the top of the needle. On the next round, knit into the back of the yarn over. In White, CO 60 sts. Join in the round, being careful not to twist. Round 1: *K2, p2* to the end of the round. Repeat Round 1 until cuff measures 1 inch. In Sky, *k2, p2* to the end of the round. In White, *k2, p2* to the end of the round. In Pool, *k2, p2* to the end of the round. In Tidepool Heather, *k2, p2* to the end of the round. Repeat last round until cuff measures 2” from cast on. 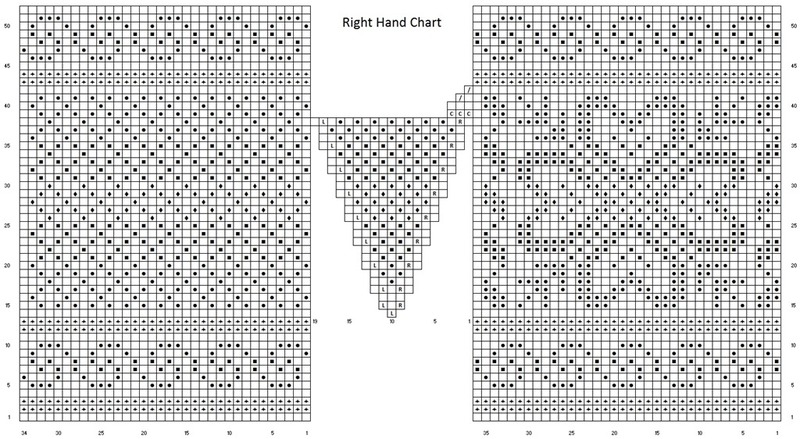 Work Right Hand Chart [Left Hand Chart] for 38 rounds, changing colors where indicated on chart and increasing stitches where indicated. It is helpful to place a stitch marker before the first increase and after the second increase to mark the thumb stitches. Continue working chart until round 52 is completed, decreasing where indicated. Ribbing: *K2, p2* to the end of the round. Repeat Ribbing until ribbing measures 1/2 inch. Cast off loosely, cut yarn and weave in ends. Return 19 thumb sts to needles, removing waste yarn. Round 2: *K1, p1* to the end of the round. Repeat Round 2 until thumb ribbing measures ¾”. Please Note: I post my patterns as soon as I’ve completed them because I’m excited to share them with you. They have not been fully tested, but they are free. I’ve made every effort to make sure that the instructions are clear and error-free. There may be typos or pattern mistakes and if you find them or have any questions, please let me know by posting a comment or emailing me, dailyskein at gmail.com. 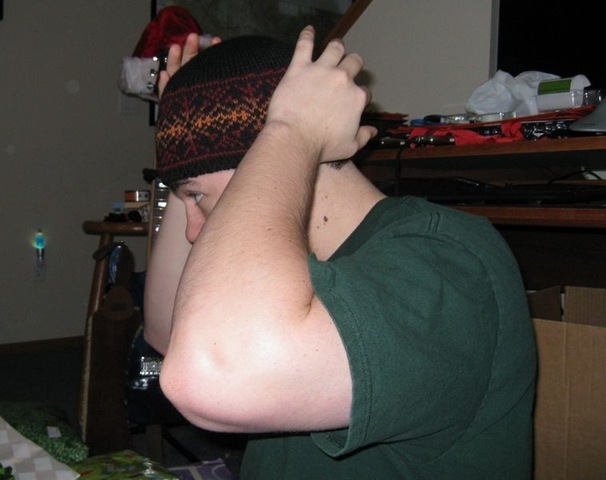 I also used this hat as an excuse to work on my tubular cast on. I don’t like rolled brims and I wanted to have the color work start as close to the beginning of the hat as possible. So, a tubular cast on with ribbing that gives a nice stretchy edge and looks almost like stockinette seemed perfect. The only drawback is that the cast on is best worked flat, but there isn’t much to sew up at the end. However, if you don’t want to tackle the tubular cast on, cast on with the long tail cast on, join in the round and work 5 rounds of ribbing. The tubular cast on will flip around until blocking. Wet blocking is the way to go- afterwards the cast on will lay flat. If it doesn’t, try running some elastic through the tube created by the cast on to hold it down. 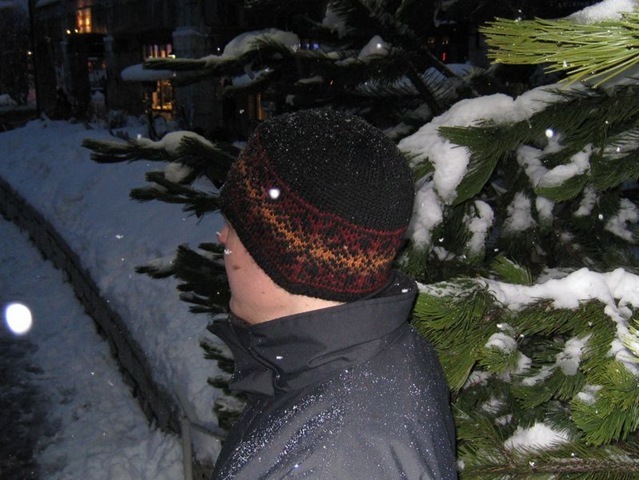 The hat is cast on flat in sport weight yarn, then joined in the round and worked circularly for the rest of the pattern. The color chart is repeated 8 times around the hat. I found it helpful to place a marker at the end of each chart repeat. After the color work, the yarn is switched from sport weight to worsted weight so that the plain stockinette section is quick to knit. There are two sizes; the only difference between them is length. The women’s size is 1″ shorter than the men’s. Tubular Cast On: There are many great tutorials online about tubular cast ons. 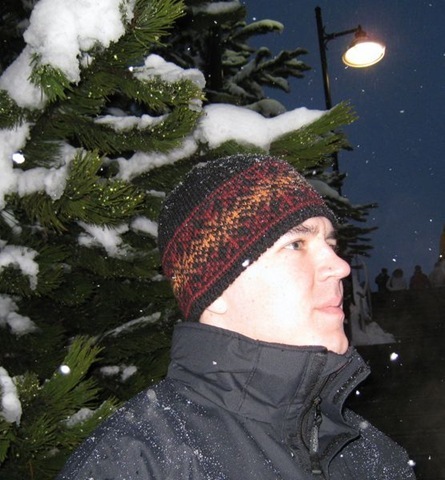 I use TechKnitter’s technique. 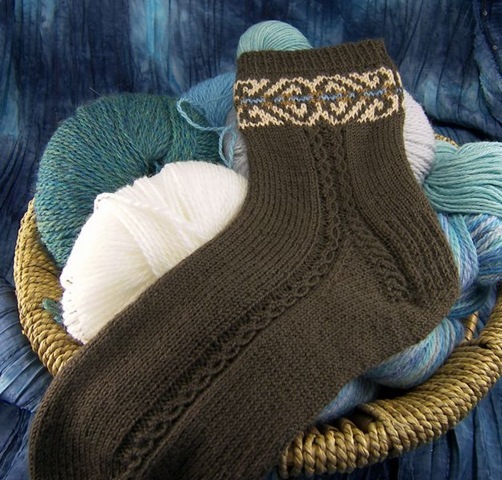 TechKnitter also links to other tutorials for this cast on. Here is a video tutorial. 1×1 Ribbing: *K1, p1* to the end of the row. Work 4 foundation rows (k1, sl 1 purlwise with yarn in front) as per tutorial instructions. Knit 1 round Garnet Heather. Switch to larger circular and join Wool of the Andes Coal. Cut Telemark Black. 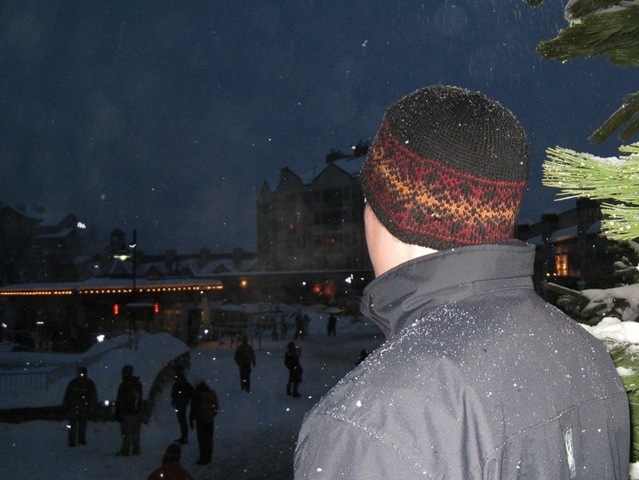 Knit until the hat measures 5.25″ [6.25″] from the cast on edge. Cut yarn and thread through the remaining stitches. Pull tight and weave in all ends. Use the tail from the cast on to sew up the gap in ribbing. Wet block to remove brim curl and relax the color work. Please Note: I post my patterns as soon as I’ve completed them because I’m excited to share them with you. They have not been fully tested. I’ve made every effort to make sure that the instructions are clear and error-free. There may be typos or pattern mistakes and if you find them or have any questions, please let me know by posting a comment or emailing me, dailyskein at gmail.com. I am fascinated by the history of knitting. 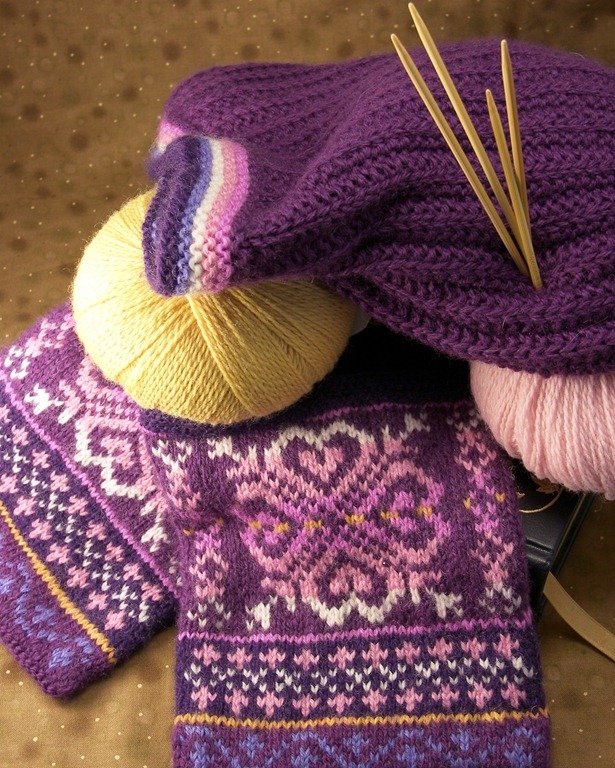 Did you know that knitting (as we know it) probably started in Egypt? Somewhere between 1200 and 1500. Most of the early pieces that have been found there have been cotton, knitted with at least two colors. And the gauge! Most of the old knitting has a gauge of 20 or 30 stitches to the inch! Insane, I say, insane! 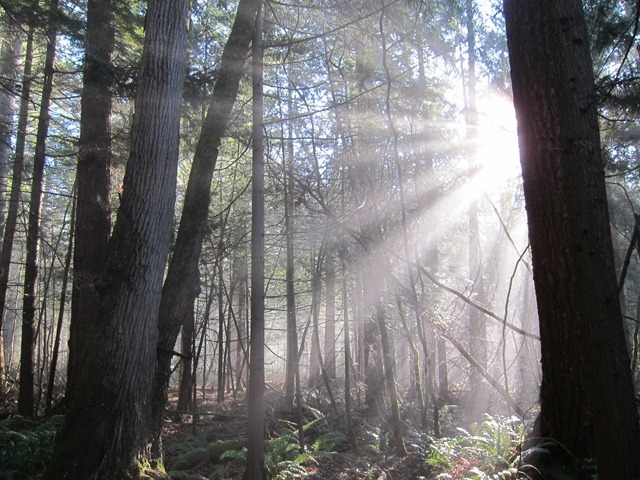 No wonder it’s all so beautiful, though. They could fit some really detailed designs on that many stitches. 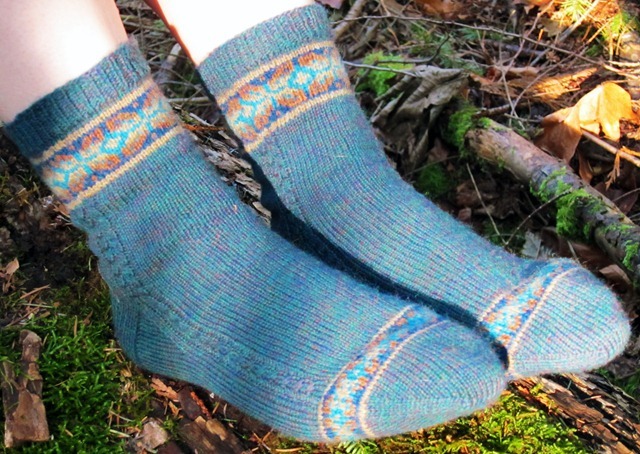 As I said in my last post, the color work chart on these socks is taken from one of the earliest pieces of knitting found. I added the extra colors, though. 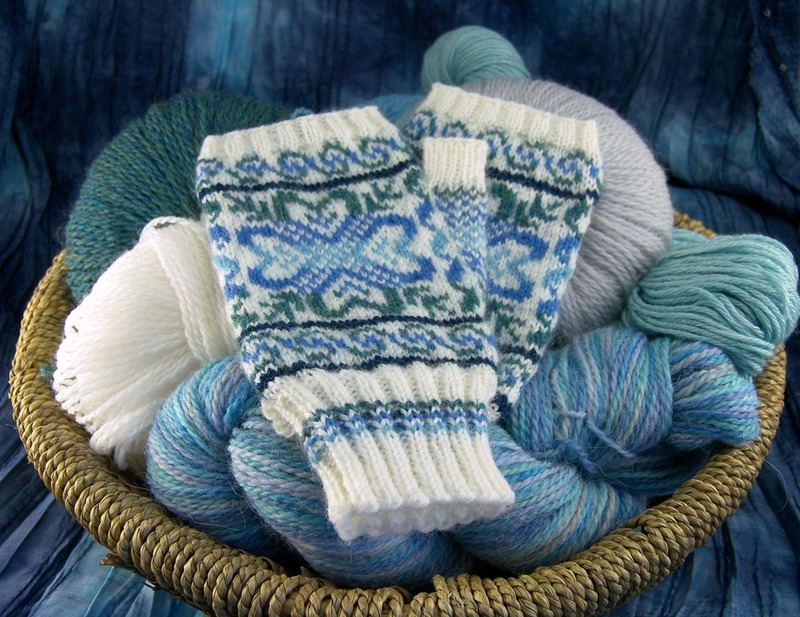 Most of the ancient knitting I’ve read about used a single color for each motif but would have multiple motifs. The "clocks" (a design that runs down the leg and splits at the heel) are also traditional but from later in the chronology. 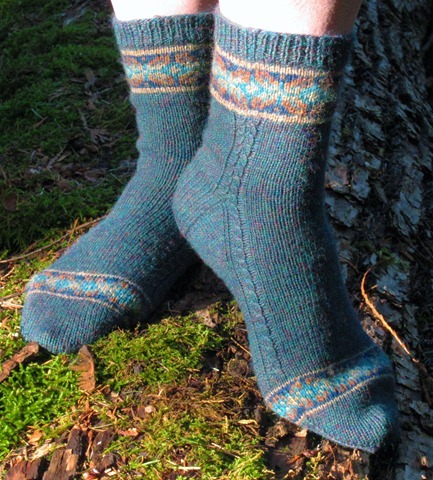 If you look at Nancy Bush’s books Folk Socks and Folk Knitting in Estonia you’ll see socks much like these, with color work at the top and clocks down the sides. 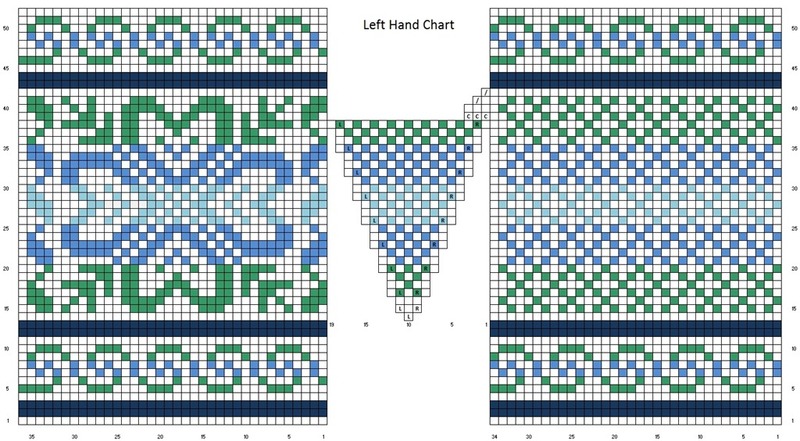 The PDF version of the pattern has symbol-coded charts for the colorwork as well as color-coded charts. Edited 4-9-09: Fixed various errors that a knitter was kind enough to keep track of. The heel instructions now make mathematical sense and I hope I’ve clarified some of the other instructions. Errata are in purple. Edited 9-4-11: Lots of small changes! Renumbered the rows in Charts A and B and added stitch numbers to all the charts. Changed the Egyptian Chart to a combined symbol and color chart which should work as a color chart or printed in gray scale. Also added the original cables to the instructions- knitters now have a choice of the classic twisted stitch cable shown in the photos or the braided cable that was actually written in the instructions. Be aware that there are two different sets of instructions for the different cables! 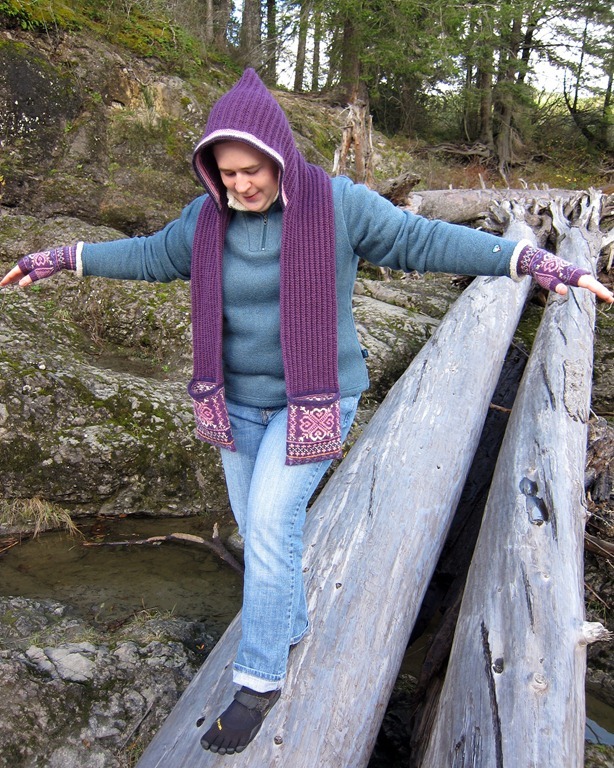 Knit TBL: Knit through the back loop. On WS rows, purl through the back loop. Right Twist: Slip next two stitches purlwise. From the back, insert the left needle into the back of the first slipped stitch. Pull the right needle from both stitches and reinsert right needle into the loose stitch from the front. Slip this stitch back to the left needle, then k2 tbl. On WS rows: Slip next two stitches purlwise. From the back, insert the left needle into the back of the first slipped stitch. Pull the right needle from both stitches and reinsert right needle into the loose stitch from the front. Slip this stitch back to the left needle, then p2 tbl. Left Twist: Insert the right needle into the back of the second stitch on the left needle. Pull left needle out of the first two stitches and reinsert the left needle into the loose stitch from the front. Replace stitch on right needle to left needle, then k2tbl. On WS rows: Insert the right needle into the back of the second stitch on the left needle. Pull left needle out of the first two stitches and reinsert the left needle into the loose stitch from the front. Replace stitch on right needle to left needle, then p2 tbl. Right Purl Twist: Perform a Right Twist, but at the end, k1tbl, p1. On WS rows: Perform a WS Right Twist, but at the end p1 tbl, k1. Left Purl Twist: Perform a Left Twist, but at the end, p1, k1tbl. On WS rows: Perform a WS Left Twist, but at the end k1, p1 tbl. CO 68 sts with smaller needles. Join in the round, being careful not to twist. Work k1, p1 rib for 1". Switch to size 2 needles. Round 4-18: Work Egyptian Chart (click chart to see full size). Switch to size 0 needles. Round 19 and 20: Knit. For Braid Cable Only Round 22: Work Chart A, p1, k23, p1, Chart A, p1, Chart B, p1, k21, p1, Chart B, p1. 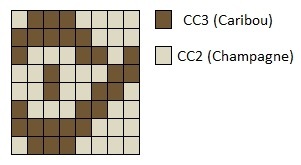 For Classic Cable Only Round 22: Work Chart C, p1, k25, p1, Chart C, p1, Chart D, p1, k23, p1, Chart D, p1. Repeat Round 22 until leg is desired length. At the end of any round, turn. Make a note of which cable row you stopped on for the instep. The heel will be worked back and forth over the next 35 sts. Put remaining the remaining 35 sts on a stitch holder or scrap yarn. Row 1 for Braid Cable Only (WS): Sl 1, work Chart B, k1, p21, k1, Chart B, k1, turn. 35 heel sts on heel flap. 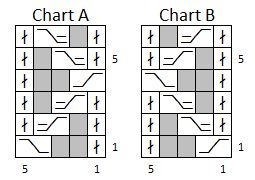 Row 2 for Braid Cable Only (RS): Sl 1, work Chart B, p1, *k1, sl 1,* 10 times, k1, p1, Chart B, p1, turn. Row 1 for Classic Cable Only (WS): Sl 1, work Chart D, k1, p23, k1, Chart D, k1, turn. 35 heel sts on heel flap. Row 2 for Classic Cable Only (RS): Sl 1, work Chart D, p1, *k1, sl 1,* 11 times, k1, p1, Chart D, p1, turn. Repeat Row 1 and 2 until heel measures 2" (approximately 30 rows) ending after a WS row. Turning Row 1: Sl 1, k2tog, k17, ssk, k1, turn. 2 sts decreased. 33 sts on heel flap. Turning Row 2: Sl 1, p5, p2tog, p1, turn. 1 st decreased. Turning Row 3: Sl 1, k6, ssk, k1, turn. 1 st decreased. Repeat Turning Rows 2 and 3, working 1 more st each row, until all sts have been worked, ending after a RS row. Next Row: Sl 1, knit across. 20 sts remain. Pick up and knit 1 st in each slip stitch along the heel flap. Pick up and purl 1 st in the gap between heel and instep. Instep: work Chart A, p1, k23, p1, Chart A. 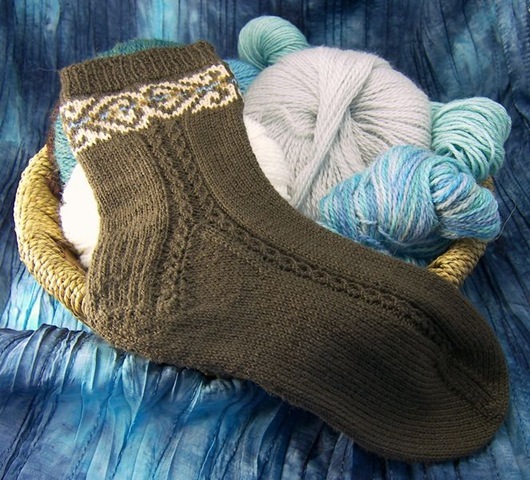 Pick up and purl 1 st in the gap between instep and heel. 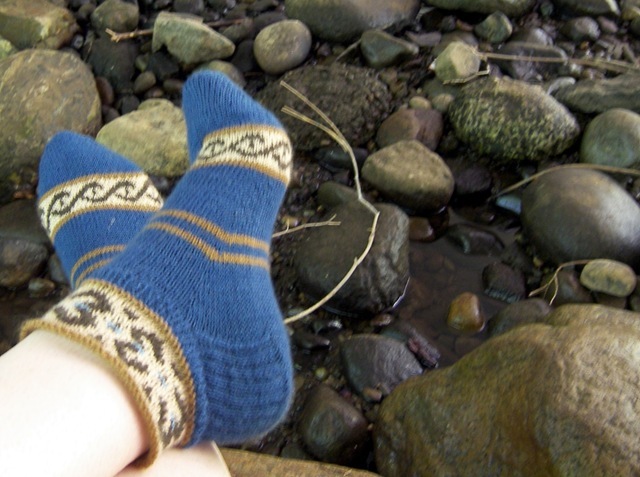 Pick up and knit 1 st in each slip stitch along the heel flap. Knit 10. Mark this as the beginning of the round. Round 1: Knit to 3 sts before the first purl st, k2tog, k1, p1, work Chart A, p1, k23, p1, Chart A, p1, k1, ssk, knit to the end of the round. 2 sts decreased. Round 2: Knit to first purl st, p1, work Chart A, p1, k23, p1, Chart A, p1, knit to the end of the round. 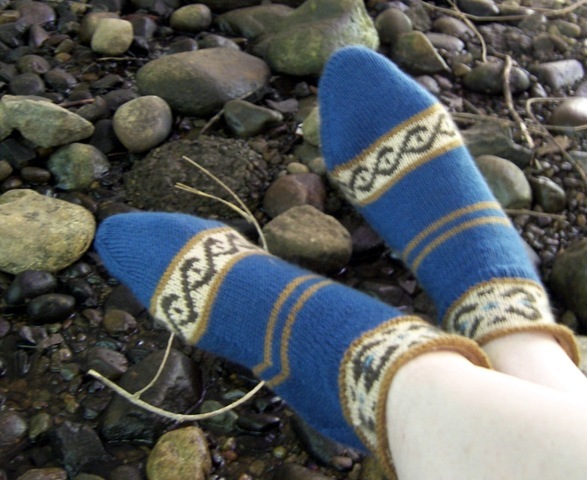 Pick up and knit 1 st in each slip stitch along the heel flap. Pick up and purl 1 st in the gap between heel and instep. Instep: work Chart C, p1, k25, p1, Chart C. Pick up and purl 1 st in the gap between instep and heel. Pick up and knit 1 st in each slip stitch along the heel flap. Knit 10. Mark this as the beginning of the round. Round 1: Knit to 3 sts before the first purl st, k2tog, k1, p1, work Chart C, p1, k25, p1, Chart C, p1, k1, ssk, knit to the end of the round. 2 sts decreased. 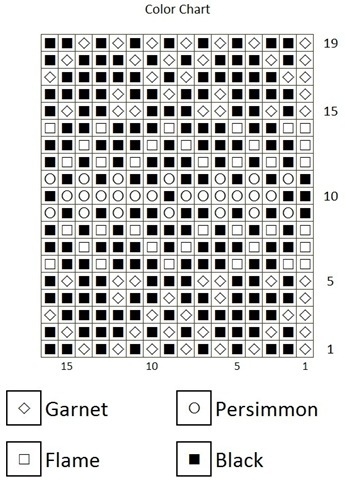 Round 2: Knit to first purl st, p1, work Chart C, p1, k25, p1, Chart C, p1, knit to the end of the round. Repeat Rounds 1 and 2 until there are 71 sts remaining. For Braid Cable Only: Knit to first purl st, p1, work Chart A, p1, k23, p1, Chart A, p1, knit to the end of the round. For Classic Cable Only: Knit to first purl st, p1, work Chart C, p1, k25, p1, Chart C, p1, knit to the end of the round. Repeat until foot reaches 2" shorter than desired length. Move the first and last purl stitches from the instep needle to the adjacent sole needle(s.) There should be 35 sts on the sole and 35 sts on the instep. Repeat Round 1 and 2 until 18 sts remain (9 instep sts, 9 sole sts). Knit to the end of the sole. Move stitches so that all sole stitches are on one needle and all instep stitches are on a second needle. Graft remaining sts together using Kitchener Stitch. Weave in ends and steam block lightly. I love these socks. They gave me so much trouble while I was making them, but I forgive them because they’re awesome. After a washing, the Louet Gems has gotten so soft. Lowell looked at the socks at one point and said “Those are pretty. They remind me of those dresses, like in King Arthur or Robin Hood.” So he gets all credit for the name. (If you don’t like the name, it’s his fault! Can’t blame me.) I love the French blue/copper combo; I’ll have to use that again sometime. 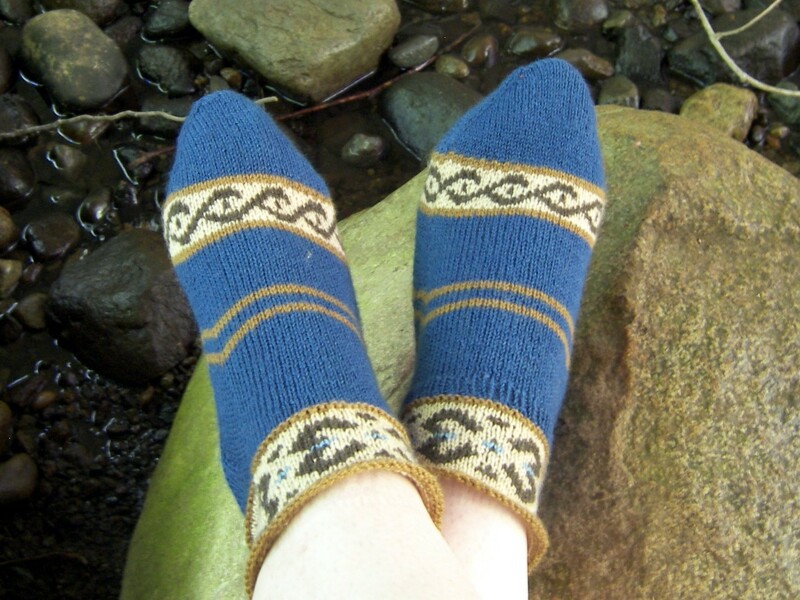 These are made using the principles in Cat Bordhi’s book, New Pathways for Sock Knitters. For those that haven’t found this great book, Cat realized that as long as you increase 2 stitches every 3 rows, it doesn’t matter where those increases are. 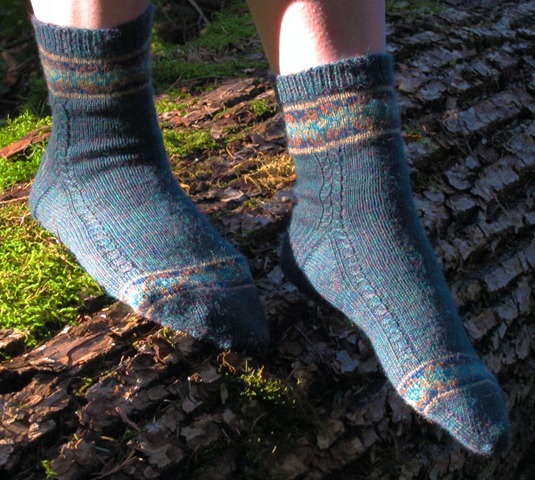 I’ve put the increases so that they look like the typical top-down heel flap gusset, but the socks are knit toe up with no heel flap. Crazy, huh? 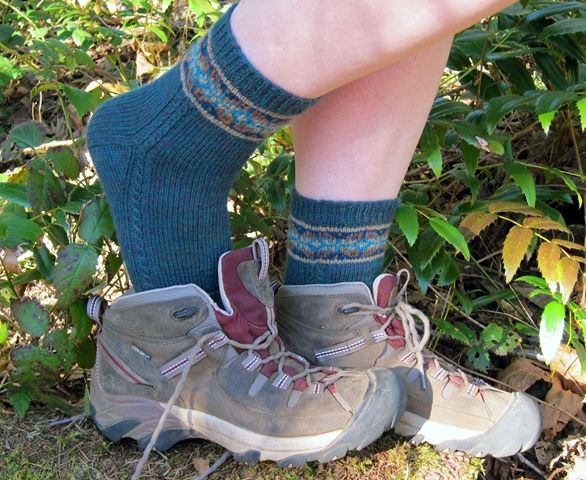 The socks end up with a slightly longer gusset section, but it fits really well. If you’ve got New Pathways, feel free to insert your own Master Numbers into the pattern. The only problem with this approach is that it makes the pattern much harder to write up (I guess that’s really my problem, not yours). This liberated increase thing is great, but if you’ve never read New Pathways it can be confusing. The increases used are lifted increases, instead of the normal M1s. You can, of course, use M1s if you prefer. Knotions has a great tutorial on lifted increases if you’ve never used them before. The part that really deviates from normal is the heel turn/”flap.” You’ll be knitting short rows for the bottom of the heel, but instead of working each row gobbling up one wrapped stitch to turn the heel, all the wrapped right-side stitches are worked right after one another in one row, then you turn and purl all the wrong-side wraps on one row. This ends up looking a lot like a standard top-down heel turn. 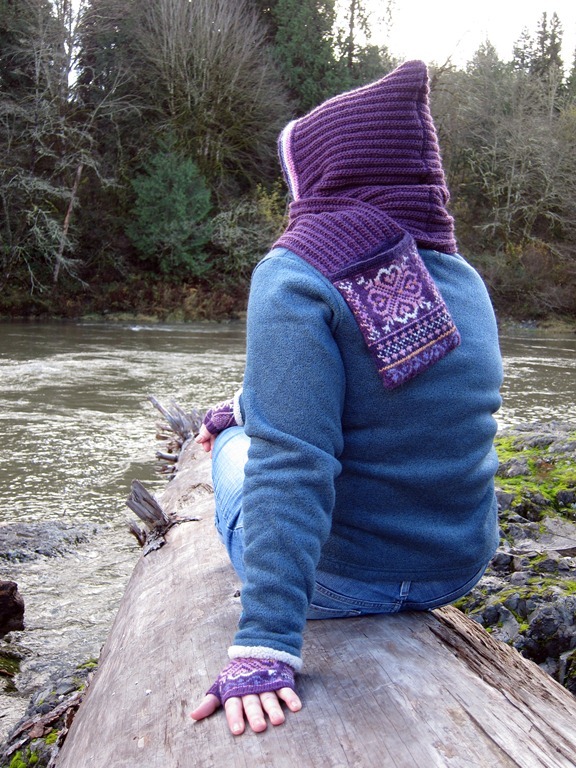 Then, you’ll essentially be knitting more short rows, in that you won’t be knitting in the round yet. 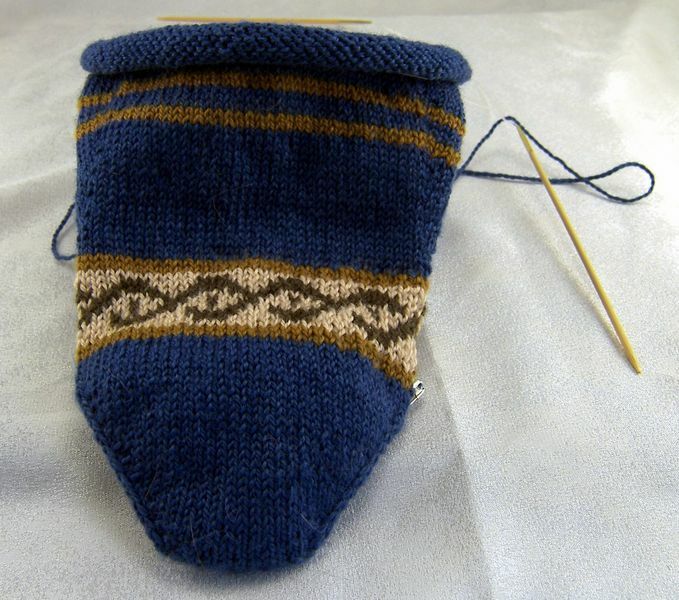 The “heel flap” is knit back and forth, but instead of wrapping stitches, you’ll ssk and p2tog to join the “flap” to the sides. This also gets rid of all the stitches increased during the gusset section. There’s some moving around of stitches, but it’s not too bad. This pattern is written for 2 circular needles. If you prefer DPNs, just split Needle 1 and 2 in half, so that you have a quarter of the stitches on each needle. Sometimes (this is so silly) I think of my DPNs as Needle 1a, 1b, and Needle 2a, 2b instead of 1, 2, 3, and 4. I can’t help you if you’re one of those freaks that only uses 3 DPNs to hold the stitches. 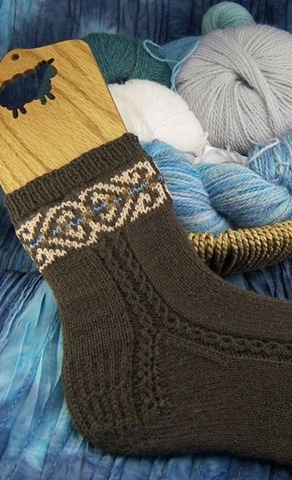 😉 The pattern uses 5 colors, but the light blue in the center of the leg color work is optional. If you’ve got stash to bust, great. If not, the Ginger or the French Blue look great in that spot, or just keep using Caribou. Fewer ends to weave in that way! 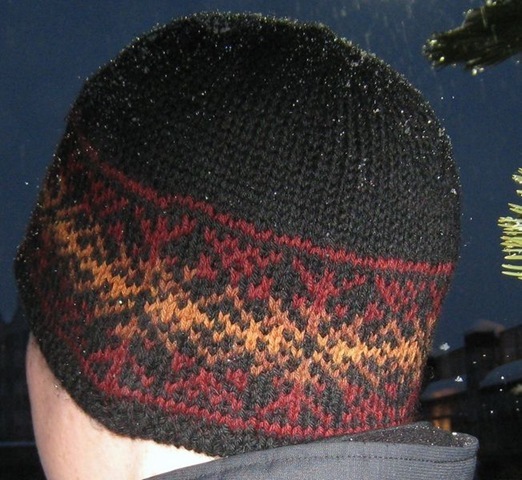 The top is one of my favorite parts, I think it looks like a crown; after the color work, a vikkel braid (from Folk Knitting in Estonia) is worked and then the sock is bound off using Elizabeth Zimmerman’s Sewn Bind Off. The edge flares out from the leg just slightly, which I wasn’t sure about at first, but has really grown on me. Oh, and you’re not imagining things, the two socks in the pictures are slightly different… I tried putting some 1×1 ribbing on one to see how it changed the fit, but I didn’t feel like ripping it back out again when I realized it did nothing. Live and learn. Edit 8/25/08: I’m sorry if the charts weren’t loading. I’m trying out some new blog writer software and I’ve had a lot of trouble with this post… anyway, I think I fixed the images. Edit 9/13/08: If you’d like more information about the sock construction without the color work or stripes, check out this post. 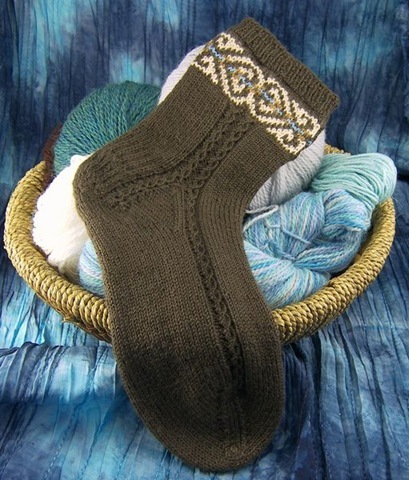 Also includes information on sizing the socks. LRinc (Lifted Right Increase): Pick up the right side of the stitch below the next stitch on the left needle and place it on the left needle. Knit into the front of this new loop. Knit the next st as normal. Picture tutorial here. LLinc (Lifted Left Increase): Pick up the left side of the second stitch below the last stitch on the right needle and place it on the left needle. Knit in to the back of this new loop. Knit the next st as normal. Picture tutorial here. W&T (Wrap and Turn): RS: Bring yarn forward between needles. Slip the next stitch knitwise. Return yarn to back of work. Slip wrapped stitch back to left needle. Turn work. WS: Move yarn between needles to the back of the work. Slip the next stitch. Return yarn to front of work. Slip wrapped stitch back to left needle. Turn work. CW (Conceal Wrap): RS: From the front, pick up wrap from underneath and move it up and over the stitch it wrapped onto the left needle (the wrap should be on the left of the stitch it wrapped). Knit stitch and wrap together through the back loops. WS: From the front, pick up wrap from underneath and move it up and over the stitch it wrapped onto the left needle (the wrap should be on the left of the stitch it wrapped). Purl stitch and wrap together. See Cat Bordhi explain this technique here. Vikkel Braid: M1 and place stitch just made on left needle. *Knit the second stitch on the left needle through the back loop then knit the first stitch as normal and drop both stitches off the left needle. Return the stitch just made to the left needle. * Repeat from * to * to the end of the round. Pass the last stitch over the first stitch of the round to return to the original stitch count. Picture tutorial here. Tip: Try joining new colors 10-15 sts before they’re needed and carrying the tails forward 10-15 sts after they’re cut to reduce the ends you need to weave in. 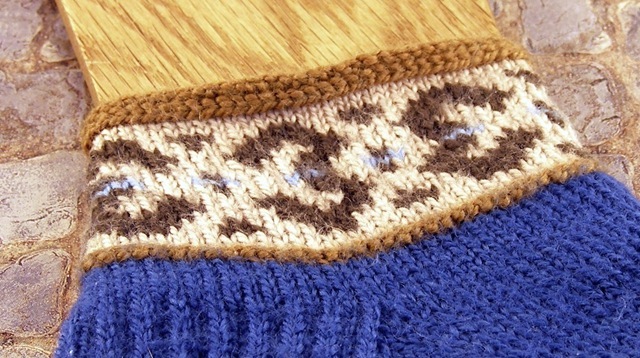 If that didn’t make any sense, check out the Weaving Ends In As You Knit Tutorial. If you’re doing color work, you probably have all the skills needed for this- it’s the same thing as catching a yarn to shorten a float, you just do it every stitch. 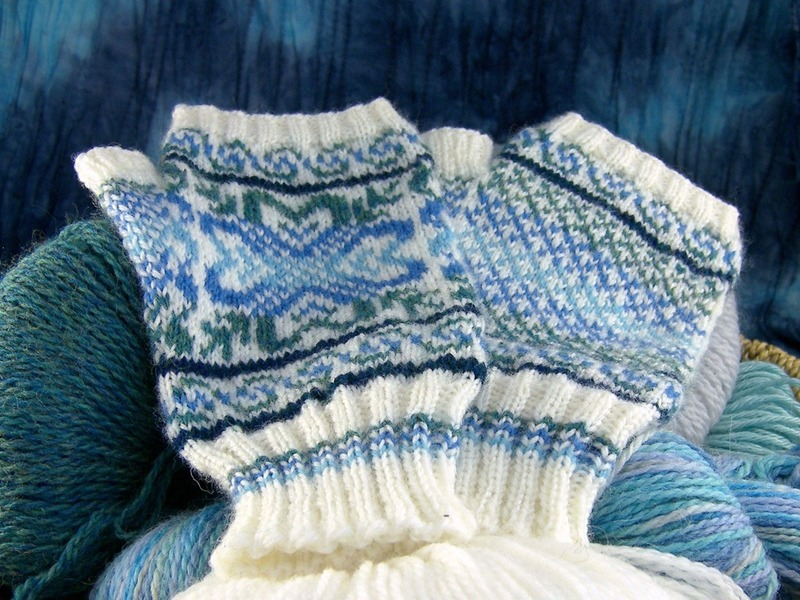 Using Judy’s Magic Cast On and smaller needles, CO 12 sts in MC (French Blue) to each circular needle. 24 sts. The starting needle is Needle 1 which will be the instep needle. The second needle is Needle 2 which will be the sole needle. Rnd 2: K1, LRinc, knit to last st on Needle 1, LLinc, K2, LRinc, knit to last st on Needle 2, LLinc, k1. 4 sts increased. Repeat Rnd 1 and 2 until there are 72 sts total (36 sts on each needle) ending on a Rnd 2. Knit 4 rounds in MC (French Blue). Knit 2 rounds in CC1 (Ginger). Knit 1 round in CC2 (Champagne). Change to Size 2 needles. Change to Size 0 needles. Knit 3 rounds in MC (French Blue). Round 1: LRinc, place marker (PM), knit to the end of the needle, PM, LLinc, knit to the end of the round. 2 sts increased. Round 2 and 3: Knit. Round 4: Knit to marker, LRinc, slip marker (SM), knit to second marker, SM, LLinc, knit to the end of the round. 2 sts increased. Repeat Rnds 2-4, until 10 sts have been increased (13 rows), ending after Rnd 4. Join CC1 (Ginger) and work Rnds 2-3. Carry MC (French Blue) upwards by twisting the yarns at the beginning of the round. Work Rnds 4 and 2-3 in MC (French Blue). Carry CC1 (Ginger) upwards by twisting the yarns at the beginning of the round. Work Rnds 4 and 2 in CC1 (Ginger). Cut CC1 (Ginger). Continue working Rnds 2-4 in MC (French Blue), starting with Rnd 3 until there are 100 sts total, ending after Rnd 4. Set up: *K2, LRinc* 6 times, k2, knit to second marker, *k2, LLinc* 6 times, k2, knit to 2 sts before the end of the round, w&t. 12 sts increased. There should be 76 sts on Needle 1 and 36 sts on Needle 2. The short rows are worked back and forth on the sole needle (Needle 2). Row 1 (WS): Purl to 2 sts before the end of Needle 2, w&t. Row 2 (RS): Knit to 1 st before last RS wrap, w&t. Row 3 (WS): Purl to 1 st before last WS wrap, w&t. Repeat Rows 2-3 until 12 sts have been wrapped on each side, ending after a WS row. 10 sts remain unwrapped in the center. Row 1: Knit to first wrapped st. Conceal Wrap (CW) 11 times, until last wrapped st. Pick up the last wrap as normal, then (treating wrap and its stitch as one st) ssk with the last st on the left needle. Row 2: Sl 1, purl to the first wrapped stitch. CW 11 times, until last wrapped st. Pick up the last wrap as normal, then (treating wrap and its stitch as one st) p2tog with the last st on the left needle. Set up step: Move the 20 sts before the first marker from Needle 1 to the left side of Needle 2. Remove marker and replace marker between the sole sts and the moved sts. 55 sts on Needle 2. Row 1: *Sl 1, k1* to 1 st before the marker, remove marker, ssk, turn. 1 st decreased. Set up step: Move the 20 sts after the second marker from Needle 1 to Needle 2. Remove marker and replace marker between the sole sts and the moved sts. 74 sts on Needle 2. 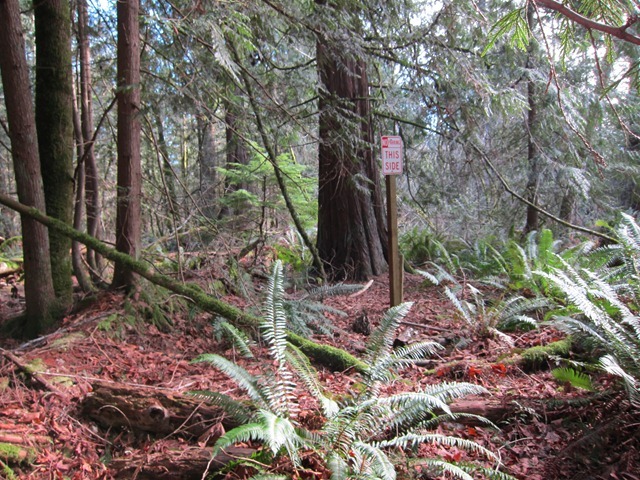 Row 2: Sl 1, purl to 1 st before the marker, remove marker, p2tog, turn. 1 st decreased. Row 3: *Sl 1, k1* to 1 st before the gap, ssk, turn. 1 st decreased. Row 4: Sl 1, purl to 1 st before the gap, p2tog, turn. 1 st decreased. Repeat Row 3-4 until 2 sts remain on either side of the gaps. Knitting in the round resumes on the first round. Round 1: *Sl 1, k1* to 1 st before the gap, ssk, k1, knit to the end of Needle 1, k1, k2tog, knit to the end of the sole. 2 sts decreased. Knit 1 round in CC1 (Ginger). Cut MC (French Blue). Knit 2 rounds in CC2 (Champagne). Knit 1 round in CC1 (Ginger). Work Vikkel Braid over all sts. Bind off using EZ’s Sewn Bind Off. I would never describe myself as someone with an “eye for color.” In high school, all the pants I owned were black so that I never had to worry about my pants and shirts matching, lol. I’m certainly not one of those people who looks at lime green and burgundy and teal and says “Yeah, that’s a killer combo!” and actually has it work out. But I think I’ve got an OK track record on my color work knits. They’re pleasant to look at. Although, I always feel secretly ashamed that I didn’t take more color risks on a project. Maybe I should have added some lime to that piece… Or some red and hot pink… Of course, maybe I shouldn’t admit this to you. Maybe I should cultivate some sort of color mystique. That way if I mess up and try some awful combo, you’ll think it’s beautiful because, after all, I’m the color expert. Haha! This project has been perfect so far. A little color, nice yarn (Louet Gems Pearl! Stash busting, baby! ), and some interesting increases. 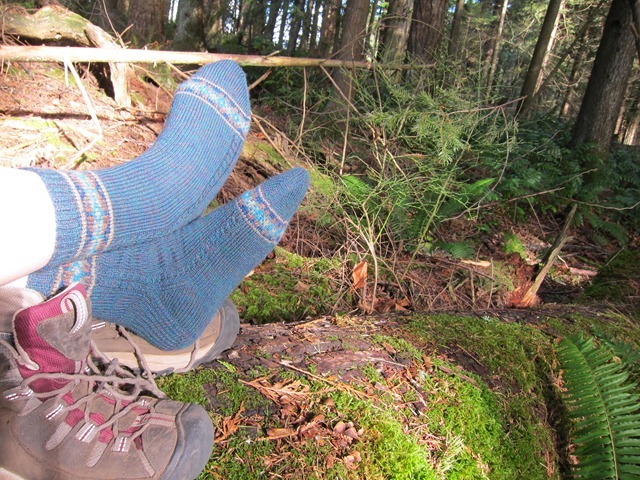 I’ve dug out New Pathways for Sock Knitters after a long hiatus. I love that book; it’s fascinating. 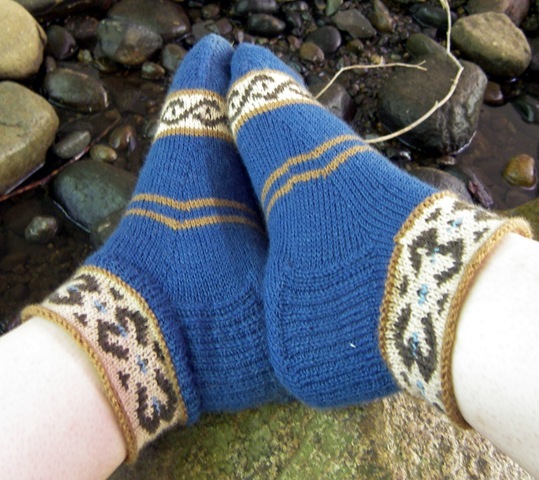 But for some reason, all the socks that I knit from Bordhi’s “master numbers” patterns didn’t fit very well, even though all the numbers were based on measurements from my own darn foot! Too loose in the heel, kind of baggy around the ankle, that sort of thing. I’ve decided to try again, though, because the ideas in that book as just too awesome to give up on. 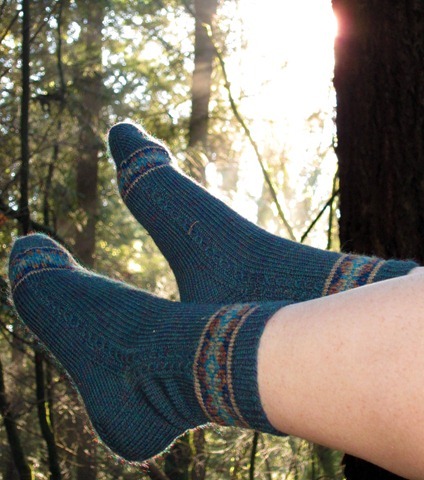 If you love sock knitting and haven’t checked out this book, you’re really missing out. (And this is from someone who doesn’t really like Bordhi’s other books.) I wanted to make a toe-up sock and didn’t feel quite like a short-row heel or the annoying math of a heel flap, so liberated increases it is! We’ll see if this sock turns out to fit better than the others, because I’m really loving them so far. 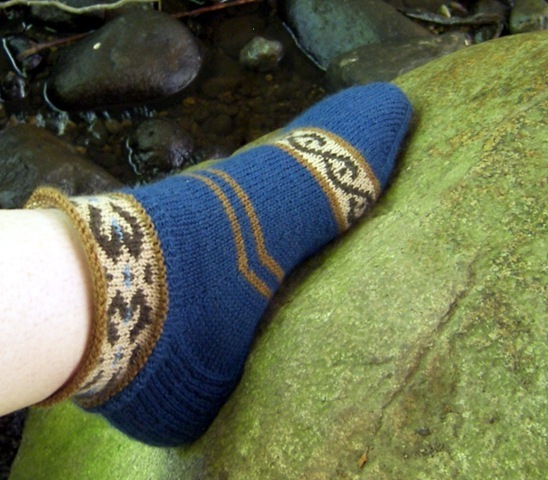 I’m going to add another band of color work just above the ankle, complementary but different from the toe section. Here’s hoping! PS: Anyone have any ideas for a name for this sock? I’m stumped. Maybe it’ll come to me when it’s finished.